Welcome to day seven of my #FrenchVillageBookworm Advent Calendar where I’m featuring a different book every day until Christmas. I have been a big fan of romance author Juliette Sobanet for many years. Her first self-published novel was the first ebook I ever read, squinting at the tiny text on Ade’s iphone on car journeys that I wished could have been longer. I have followed her career, swooned my way through many of her novels and novellas, where the men know just how to treat a lady and the France they are set in is full of chocolate, patisseries and cobble streets paved with love. This book however is very different and my excitement about getting my hands on a new book from her was equally matched with apprehension at discovering the inner secrets of Danielle, the real person behind the romance author Juliette. The fact there is no real Juliette was a shock at first, but as a social media follower I knew this before reading this book. 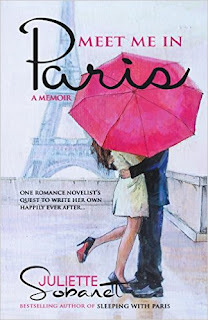 Meet Me in Paris: A Memoir is the true tale of a hopeless romantic addicted to writing, travel and France who found herself in a marriage where she had to be someone she wasn’t for everyday life to tick over nicely, despite loving a husband who also loved her. One day she spread her wings, took off to experience freedom and to find the passion she could only write about, divorcing her husband and having an affair that gave her great highs but deep lows too. She is a good example of the torment of the creative mind who needed to flee what she feared was slowly killing her inner soul, but the price of freedom was high. It was not an easy journey, there were some very dark days for her when loneliness and depression zapped her of her energy and threatened her life. There were times when I felt very sad, times when I felt she was selfish and times I wished she would just stop making the wrong decisions and get on a plane to France, which she does numerous times throughout the book. Ultimately this book is a journey of discovery and recovery, where Paris and Lyon try their best to soothe her troubled mind and help her move forward to a happier place. She just needs to work out where to find this happiness; is it in France, in her marriage, in the arms of her lover or is there something else? Her writing certainly became very important in her healing process and this led to an emotionally charged memoir that contains some strong language and scenes of a sexual nature. At the end of the book I found myself wondering how I felt. Danielle has slightly deflated my dream of the typical life I expected a romance novelist like Juliette Sobanet to be living, but I can’t help but feel privileged she has shared her real life with her readers. Characters in a novel have ups and downs before finding their happily ever afters, real life is a different story altogether. She will always be Juliette to me and I can’t wait for her to feel ready to write another chocolate filled romance set in France. Meet Me in Paris: A Memoir is available in ebook and paperback format and links to Amazon can be found below. To read my reviews of her novels click on the links below, to read the guest post she wrote for me about her novel Midnight Train to Paris click here and for my France et Moi interview with Juliette click here.